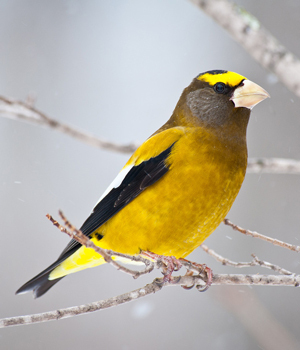 The success of field volunteers for the Wisconsin Breeding Bird Atlas II has made it possible to offer project supporters the opportunity to sponsor nine additional species that will be featured in the final publication. These are in addition to the 239 species already offered and claimed through the Sponsor-a-Species program, the largest private source of support for the second Atlas. All previous sponsorships are listed at https://wsobirds.org/sponsor-a-species-who-are-the-sponsors. Sponsors have selected species that have personal meaning or interest to themselves, their families and friends as well as their organizations. As the largest bird survey in state history, a great deal of field work is being undertaken by citizen scientists and the in-kind efforts of agencies and organizations. Although the Atlas is primarily the work of volunteers, it’s vitally important to be able to hire seasonal professionals to ensure statewide coverage. Funding from Sponsor-a-Species is used 1) to hire seasonal ornithologists to survey remote and hard-to-access priority blocks where there are few volunteers, and 2) to conduct special point count surveys that will provide rigorous models of relative abundance and information on statewide population size for many species of interest. These surveys were not even attempted for the first Atlas. The cost of these seasonal hires totaled nearly $109,000 in 2018! The Atlas Development Committee has established a goal of securing sponsors for every species by Jan. 1, and two of the new nine already have secured sponsors. Sponsorships may be completed in one or two payments, with at least half due by the end of this year and the balance by Nov. 30, 2019. Rusty Blackbird. Photograph taken by Scott Giese. Each Tier 3, 4 and 5 donor completing a new full sponsorship will receive a 12-ounce package of Scarlet Tanager Dark Roast organic, fairly traded Smithsonian Bird Friendly Coffee, marketed through Bird City Wisconsin. (The Scarlet Tanager graces the logo for WBBA II.) Tier 4 donors completing their full pledge this year also will receive one of the aluminum WBBA II tanager water bottles used in launching the Atlas effort; Tier 3 donors paying in full this year will receive the coffee, the water bottle and a special glass Scarlet Tanager Christmas ornament. Donors interested in sponsoring a species can do so online at https://wsobirds.org/sponsor-a-species-2018 or by completing the form on back of this page and mailing it as instructed on the form. Ryan Brady, a DNR biologist and Atlas Science Committee chair, found a pair of American Three-toed Woodpeckers in Bayfield County. They lingered into May but eventually vanished. Eared Grebes over-summered at Goose Pond in Columbia County. A pair was observed building a copulatory platform, and likely attempted a nest but no nest or eggs were definitively found. Chuck-will’s-widow has been recorded three of last four summers, and White-winged Dove records are on the rise, with a July 2017 record in Burnett County and July 2016 records in Lafayette County. Questions about potential sponsorships can be addressed to Development Committee member Carl Schwartz at cschwartz3@wi.rr.com or 414-416-3272.